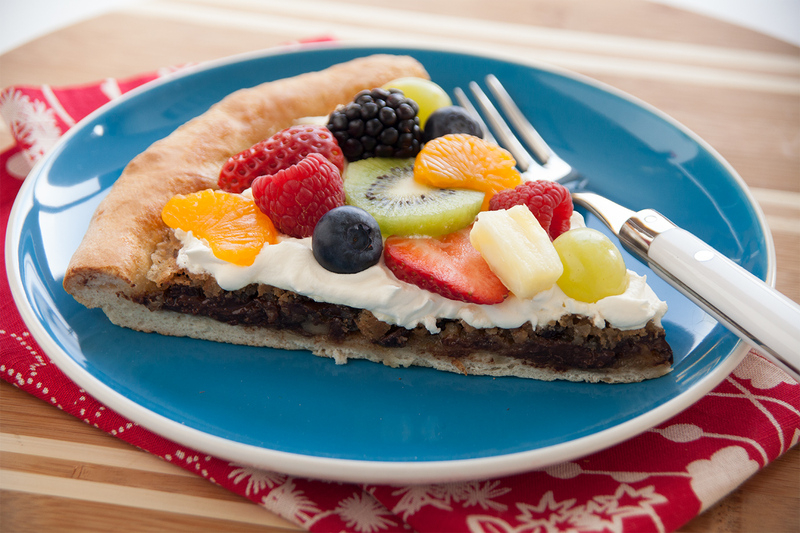 This variation of fruit pizza has chocolate chips as an additional taste delight. Spray counter lightly with non-stick cooking spray. Roll combined rolls or loaf into a 13-inch circle. Cover with plastic wrap and let rest. Beat egg until foamy. Blend in flour and sugars. Add butter and mix well. Stir in chocolate chips and nuts. Remove wrap from dough and place dough in a sprayed 12-inch pizza pan, forming a ridge to hold chocolate chip filling. Spread filling evenly over bread dough. Bake at 350 degrees F 20 minutes or until golden brown. Remove from pan and set on wire cooling rack. Cool completely. When cool, spread whipped topping over chocolate chip filling. Top with your choice of fresh fruit.